Mushon Zer-Aviv is an Alum whom developed several collaborative projects throughout 2008-2010 at Eyebeam. His work focuses on developing sustainable networks and software that subverts the Internet’s neoliberal agenda to give back agency to local communities. Learn about the most recent projects he has been working on in the conversation below. Eyebeam: So, I thought we would start with your work at Eyebeam, mainly the ShiftSpace project, to see if this has informed any of your current work or continued to have an influence on anything you’re working on. Mushon Zer-Aviv: Yeah, so–I think–I’ll just say that–you already know I’m based in Tel Aviv, that’s where I came from in 2005 and moved to New York to do ITP, and I was at Eyebeam two days after I landed in New York because I worked with some people from Eyebeam back then and we worked towards the Upgrade! International gathering–another thing that used to take place at Eyebeam–the monthly Upgrade! gatherings. I used to run the Upgrade! Tel Aviv node of this network, and when I moved to New York, I started working with Yael Kanarek on the New York node that took place at Eyebeam. So, when I arrived, we had like two or three weeks before the first Upgrade! international gathering that happened at Eyebeam. So that got me pretty early during my time in New York. And then, at ITP, I did my masters there and the thesis project that I worked on with Dan Phiffer, we did a thesis together. It was called ShiftSpace. I think even before we finished ITP, we used to meet at Eyebeam to develop it and then we kind of continued afterwards and the project has become affiliated with Eyebeam and that’s something I’ve been working on with a team until 2010. Eyebeam: Do you find the idea of a public space on the Internet is at all related to your more physical work with space and geography/tourism? MZA: In a way, when we started working on the You Are Not Here platform–that was also a project that started at ITP. We were working on You Are Not Here and on Shiftspace at the same time and in a way they were the same project; both of them were augmenting space–whether it is virtual space or physical space, and both of them trying to create a layer above the space that is kind of ground level, either ground level of the city or ground level of the web. So there were definitely correlations between the two. By the way, you mentioned that project, You Are Not Here with the tour of Baghdad through the streets of New York, then the tour of Gaza through the streets of Tel Aviv. I recently came back to this project and I have a new project that just came out a few months ago, I’m actually still working on it–it’s only a pilot that we’re launching. It’s called “Speculative Tourism.” This time, we’re working with Jerusalem. Jerusalem is not a city that needs another city layered on top of it. Jerusalem is already a city within a city within a city with different communities and different narratives and really contrasting perspectives of the narrative of the city and of the ownership of the city. So, the conflict is already there–in the present and in the past. Jerusalem is a city that has a very strong history–so strong that you can hardly live in the present, let alone think about the future. We wanted to tour the future of Jerusalem. Or rather, the futures of Jerusalem. We (Shalev Moran and myself) turned to a couple of authors and invited them to a workshop where we initiated process work. They would each imagine a future for the city and then write, for that future, a narrative that is a guided audio tour. And this audio tour, unlike the tours from 2006-2007, this time it’s happening obviously through a mobile app–so you actually need to be in a certain location. You see a map with markers and, only when you are in a certain location, that future is exposed to you. Eyebeam: What kind of futures are people exposed to? MZA: So we have really different futures and the more interesting issues to try to see how the authors think about the future. Some of them have taken it to a political perspective, others a more social/economic perspective: e.g. women’s rights. So for example, one of the tours is called the March of the Hanging Women. Jerusalem is a pretty religious city and very conservative and in today’s present, there is a lot of reactionary developments against women’s rights, against women in public space, women on ads because it hurts the feelings of the religious people, because they just can’t see a woman it’s just too tempting for them apparently. This author, Sarah Blau, extrapolated into the future a scene where the situation becomes more extreme and this feminist activist member of city council leads a demonstration on International Women’s Day against what’s happening in the city and then the counter-demonstration becomes violent with men turning against the protestors. The day after, this woman is found hung on a billboard with a sign, kind of a graffiti tag that says “this is the only way Jerusalem’s women will hang in public”. This political murder that they tried to spin as a suicide made her a martyr. The tour is actually a protest. The tourist guide is actually telling us the story of what happened back then and what has happened since–there’s this whole mystic level as well where people claim that they see her ghost, and she’s kind of haunting (Dybbuk) both men and women to go against the patriarchy. So this is one story, but a very different one would be in English called The Zuckerbergs in Jerusalem. So in the past couple of decades, or rather in the following couple of decades, Mark Zuckerberg and his family are getting closer to Judaism, and in 2086, he’s coming with his extended family, his children, his grandchildren, his great grandchildren, to visit Jerusalem for the last time before going to Mars. Because of the environmental degradation of Earth, the super-rich are leaving Earth for Mars. Some of them are Jews, and specifically the Zuckerbergs, are saying one last goodbye to the holy city. They’re staying in this super rich hotel that is famous for hosting diplomats and world leaders and so on. So the tour guide is speaking as the family’s Israeli tour guide and we’re all waiting for Grandpa Mark while he tells us the story of the hotel, the city and the economic strife and the history of terrorism. The tour has three spots, and at the end Grandpa Mark arrives and the tour guide is trying to blow himself up–the tour guide is actually a terrorist from what’s called the Judeo-Arab-Marxist brigade–or something like that. So this is post-Israeli-Palestinian strife and more about economic strife. Spoiler alert: he doesn’t manage to blow himself up. It’s all kind of funny. Anyway, there are a lot of stories, including optimistic ones. I’ll just give you another one–it’s important. One of the tours is led by a Palestinian and an Israeli that are both part of a new political initiative called Two States One Homeland that is trying to get out of the deadlock of the Two States Solution that doesn’t really work. And they try to suggest kind of a confederation between Israel and Palestine with open borders and shared control of Jerusalem, and this is an actual current political initiative. And the tour is about twenty years in the future when they are leading a tour for young diplomats that are coming to learn from the success of this initiative and are actually going to an archaeological site which is in the Palestinian village Silwan, but it’s currently also referred to by far-right settlers as the City of David. Currently, the settlers are digging there trying to claim that this is where King David used to live, but while doing that they are ignoring the Palestinian history there. So in the future, we go to that archaeological site and it is run by both Palestinians and Israelis that are together digging to find the remains of both people. So, there’s a lot there. These are just three out of eight stories in the app. 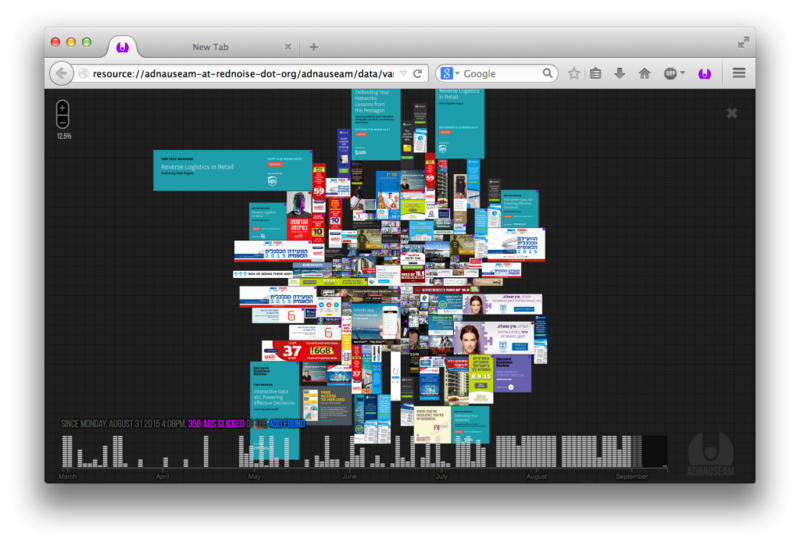 Eyebeam: Who do you think is the audience for these tours? MZA: Jerusalem and tourism go well together. Experiencing the narrative of the city through tourism is something that is part of the DNA of the city, but then in recent years, tourism itself has become an opportunity to challenge certain truths or certain narratives. I’m interested in both residents of Jerusalem Jews and Muslims and Christians and atheists, and tourists coming to learn about Jerusalem, to experience it. They usually get a very different narrative, and all of the narrative is about the past. It is never about the future. The kind of futures these narratives suggest, by inheritance, are unsustainable. If we have this experience of walking in the street from the perspectives of the futures, rather than the perspective of the past, maybe we can make better decisions. This ties into the wider set of interests that I have now about the ways we imagine the future. I’m working a lot with data and as a designer I’m also working with different initiatives trying to use data to make better predictions about the future, and some of the predictions I actually think are very potent–like the prediction of energy consumption. One of the biggest challenges we have now is changing the energy market in general, and consumption specifically, and transferring to renewable energy, and so on. So, I’m working with a company on these challenges and for that we are using consumption data, like energy consumption data and light radiance. We are using a lot of data from the past to think about the future. And that makes sense when you are trying to foresee things that are probably going to repeat themselves, but the thing is, I feel like, the super powerful way of using data and algorithms to think about the future has kind of crippled our imagination. I think data and algorithms are inherently conservative because the main idea is that what has happened will continue–the pattern that we can identify in the past would continue into the future. First of all, I don’t think that this is the only way to use these algorithms. Secondly, I’m really concerned about how we’re outsourcing so many of our decisions to these technologies, while the technologies cannot imagine a different future. And I see more and more turns toward technology that will decide the future for us rather than a political process that would lead us in a different direction that I feel is very needed. The way we worked in the workshop with the authors and kind of led to a very different result is that rather than using the methodology of forecasting–which is kind of extrapolating patterns from the past into the future–we used a technique called Backcasting, where we try to image a reality in the future and then imagine that world and try to go back from that future to our present to try to see what would need to happen to get there. In this way we can start to think, “okay so this is what the past is telling us, but what does our desired future tell us, and how can we get there?” And some of the authors took it to a more Dystopian future. The last example that I gave you is a very Utopian future, but I would say it’s very hard for people to think about the future in positive terms–that’s something that came out of the project. The more that I investigated it and looked at it in science fiction and thinking about technology in general, you see it’s pretty rare to see Utopia–not even full-blown Utopia, even futures that are not Dystopian. And I think that’s a huge problem. I’m getting more and more into that; to try and understand why we are afraid to say what we want rather than just focusing on what we don’t want. This is a very rare, half-baked idea, but I think to a certain degree dystopias are also based on a very conservative tendency of all of us. Because we are so afraid of change, that we cannot imagine something good. We can imagine losing what we have. Even if you think about dystopias that are very critical–the one dystopia that everyone is talking about these days: The Handmaid’s Tale. In that future, even though the perspective there is very critical of that future, it’s not talking about moving forward, it’s marking where we are as the best we get. First of all, I think it’s very problematic. Second, I think it’s the same problem that we have with climate change. Like the whole debate around–I wouldn’t say debate–the whole narrative of climate change is that what we have now is as good as it gets, and it’s going to get worse from here. I think for many people it’s very hard to rally around this idea, and we need to try to think of different ways to think about our future if we want to get to a better one. And use technology not as a way of imagining the future for us, but as a way of giving us some context and some tools for extending our imagination. I could go on forever like this–which I’m actually going to do in a month from now. I’m going to speak at the re:publica conference that usually happens in Berlin, and now they’re doing one in Dublin and one in Thessaloniki. And I’m going to give a talk together with Maya Indira Ganesh. The title of the talk is The Political Tragedy of Data-Driven-Determinism, and we’re going to try to unpack these ideas. Eyebeam: So, I also wanted to talk about the AdNauseam project–if this for you is more about activism or protection and privacy? MZA: I think it’s a bit of both, but for me the protection–I don’t think that tomorrow everyone is everyone is going to start using AdNauseam, but I think more than the technical protection that AdNauseam can give, the importance is the narrative it provides. And the narrative of AdNauseam is that it goes against the myth of big data: the myth that we already know everything. For anyone, who’s ever worked in big data–really–they know how messy it is; there are so many inferences that you can make and they’re so full of holes, that I think we need to understand that when I talk with people about privacy many of them say: it’s too late. Privacy is dead–because that’s what the market wants, that’s where things are going and you can fight it, and maybe it’s a bit good. But this is the sentiment of big data: that everything that can be captured, should be captured. And everything that can be analyzed should be analyzed. And then every analysis that you make, is out there for grabs. But then, the problem with the privacy debate is that so much of it has become about protection and hiding and dangers–it’s almost religious, you have privacy experts saying: oh you shouldn’t do this, oh you shouldn’t do that, you should hide, what kind of person are you for not encrypting your email? And people don’t go online to hide. They go online to do quite the opposite. We don’t even go online today, we’re just online–and we want to live our lives, not just hide and hide and hide. So I think that the main proposition of AdNauseam is that another way of resisting is to take it to the extreme: you want big data? Let’s see how big data can really get. We can really push it beyond that myth to kind of explode to the level that you can gain your freedom within this performative space, that is not about hiding–it’s quite the opposite. And probably hiding would protect you much better than obfuscation, but I think the narrative that obfuscation gives is different than all the privacy tools that are about hiding that reinforce the myth of big data. They’re basically saying: they do know everything about you, and therefore, you should hide. What we’re saying is: no, they have to make a lot of inferences and run a lot of statistics where there’s so much room for error that we should actually extend that room for error, because that room for error is where we get to be human, it’s where we have our autonomy and our freedom–and that’s what privacy is for. Eyebeam: Do you have any other current projects that you’re working on that you’d like to share? MZA: So, the main new project is the Speculative Tourism project, but there’s another project that I worked on recently–less than a year ago–that I haven’t really spoken about or even documented properly. It has to do with prediction as well and with the environment. It’s a work that I did for an exhibition on water in Seoul. It’s called IWBA: the International Water Bank Association. As I was doing some research towards this exhibition, I came across water banks. There are banks that invest in water; they buy water, like underground water. They privatize underground water as an investment. And the economic premise of this investment is that, in many places in the world, we are going towards drought. And when we go there, the value of privatized water would soar. This is as extremely antisocial as capitalism can get. For most people, you don’t even think of water as property, but then if you look at the predictions of where the world is going, with water shortages in so many places in the world, you see that this is going to become more and more of a reality. It’s already a reality in many places in the world. So, for this exhibition I worked with Wonyoung So. Together, we founded the International Water Bank Association which is an umbrella organization for water banks. We founded it; it has a logo. And we became platinum sponsors of the exhibition, and as a part of our sponsorship, we had a booth in the exhibition. That booth is an ATM for water. 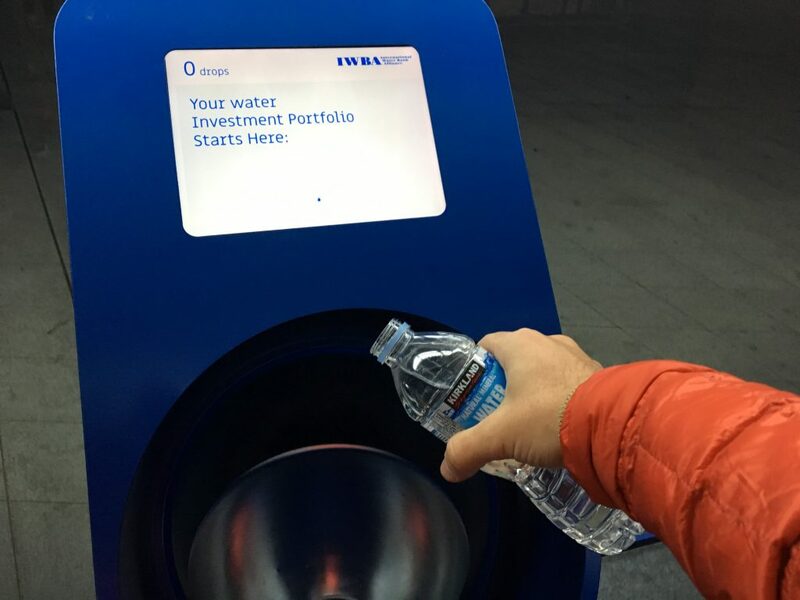 It’s only a deposit ATM, so you actually get there, it’s like a water pipe coming from the ground, and you pour water into it to start your water investment portfolio. It has a sensor that actually counts the number of drops that you’ve poured into it, and then after you’ve poured the water in, you see the drops on the screen. There’s kind of a touch screen–and then you see a map of drought prediction in the world, and you can decide where you want to invest, which water market you want to invest in, you drop your drops into these markets. 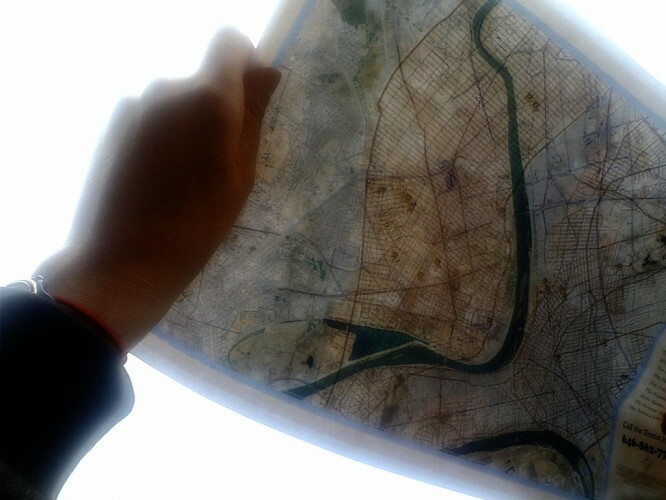 You can also see the map, it has another view which is: there’s prediction of drought, and there’s prediction of profit. The prediction of drought is in red; the prediction of profit is in green, but it’s the same data–so you see the exact same thing with different colors. And then as you invest all of your drops, you enter an email and you get an email with a review of all of your investments and the happy message that: “remember tomorrow’s drought is today’s opportunity.” So, obviously, a very cynical project, but hopefully an opportunity to even start to think in the terminology that some people in the world think about, and unfortunately we need to account for that. So, the future. The future; it’s all about the future. I want to crack this positive thing. There’s one thing you should write. I’ve found this, I’m still exploring it, but I found this genre, it’s kind of an emerging genre in science fiction called Solarpunk. So, it’s like Cyberpunk and Steampunk, but it’s Solarpunk. And the thing about Solarpunk is–unlike the other punks–it’s imagining a future where people have found a balance between the use of technology and the environment. And it’s a positive future. It’s still full of conflicts, and there’s still the punk there, but at the same time, it is trying to imagine a future where we find a way to balance these two aspects of our lives that seem to be at odds. And they’re using solar energy not only as one of the marks towards this future, but also as metaphor. The idea of distributed renewable energy production (you know, you are running a solar panel, I’m running a solar panel, when we don’t use the energy that we create, somebody else uses that) so they’re saying it’s not only about distributed energy production and consumption, it’s about distributed power. So, it’s also kind of a social metaphor. So, I think, to tell you the truth, most of the things that I’ve seen under the #solarpunk on tumblr are total kitsch, but at the same time, there is a sentiment that I really appreciate, and I would love for my work to be more optimistic. That’s an optimistic note to finish an interview. More information about Mushon Zer-Aviv work can be found on his website. Article by Communications Intern Amber Parris and edited by Leandro Huerto. All photos courtesy of the artist. 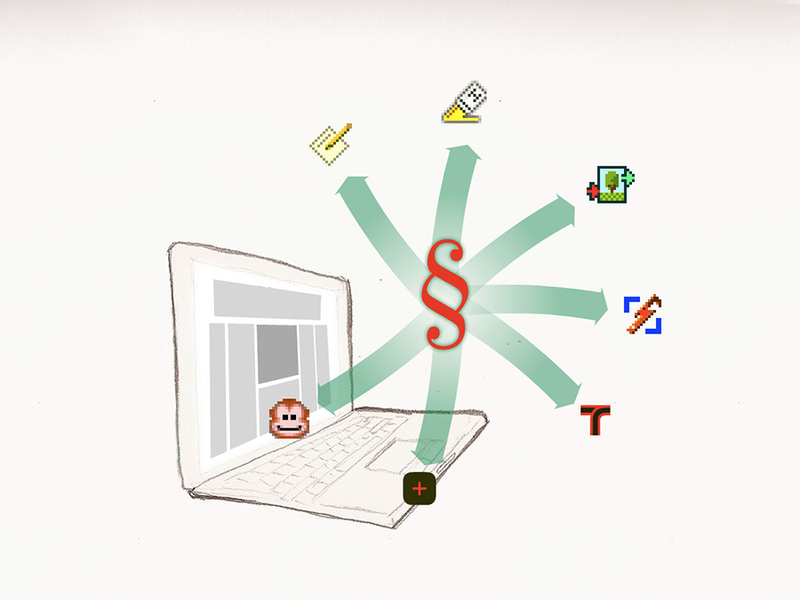 Header gif: ShiftSpace by Mushon Zer-Aviv (2009).